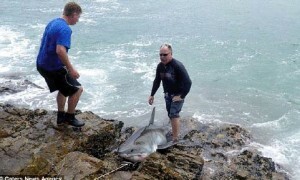 A South African man has become the first person in the world to be convicted of killing a great white shark after he hooked one while fishing from the shore. 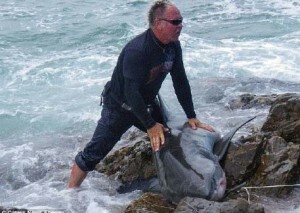 Leon Bekker, of George, Western Cape, pleaded guilty to contravention of the Marine Living Resources Act which includes attempting to kill, disturb or be in possession of a white shark without a permit. Bekker pointed out that he had no idea at first that he'd hooked a white shark but he pleaded guilty so as not to waste the court's time. But in a landmark decision Mossel Bay Magistrate's Court handed him a fine of R120,000 (£8,550) or a 12-month prison sentence, suspended for five years. The unprecedented case is the only white shark conviction in a South African court to date - the first country to impose legislation in protecting great white sharks. White sharks have been protected in South African waters since 1991 and no person is permitted to catch them, or even to attempt to catch them.